SIIG's Wireless Dura-Duo Keyboard & Mouse Combo is designed to provide durability and efficiency with wireless operating range supported up to 33ft for both keyboard and mouse. Spill-proof keyboard with sealed membrane featured to resist liquid spills offering peace of mind. Weighted metal panel is integrated to the bottom of the keyboard provides durability and extra stability on different work surfaces. 12 function keys allow instant access to applications such as internet, e-mail and multimedia control. The 4-button scrolling optical mouse with 3-level adjustable resolution supports smooth and precise movement. 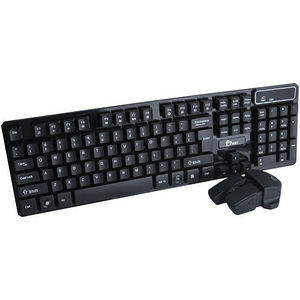 This wireless multimedia keyboard and mouse duo is built to last and enables greater operating flexibility by a reliable, long-range wireless connection.